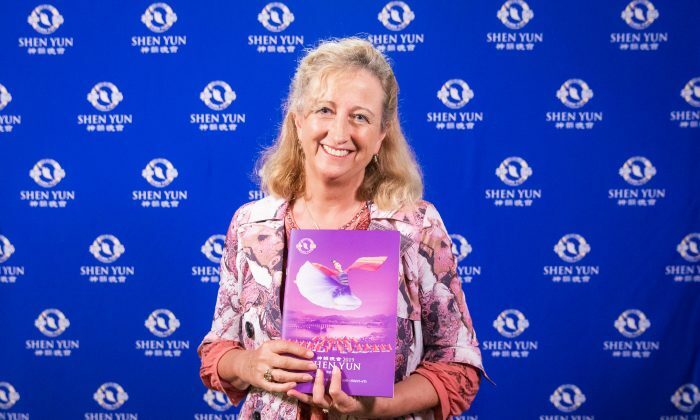 TAIPEI, Taiwan—Linda Slade, actress, artistic director of a theater company, and professional vocal trainer, was among the audience to see a Shen Yun performance at the National Dr. Sun Yat-sen Memorial Hall in Taipei on April 11. “[The performance] gives you hope. It gives you hope for the future, of what is our purpose here, and how does that connect to divinity,” Ms. Slade said, commenting how what she took away from the performance. Shen Yun Performing Arts is a classical Chinese dance and music company founded in New York in 2006. The performance on stage is accompanied by a one-of-a-kind orchestra, combing Western symphonic instruments with traditional Chinese instruments. The performance was much more than just the innovative backdrop for Ms. Slade. She said that it was also very beautiful seeing the different colors and listening to the classical music played by the orchestra. Ms. Slade said she was “empowered and excited” by how love and divinity came through the music, the dance, the colors, and the beauty of the performance. Before coming to see Shen Yun, Ms. Slade described how she knew somewhat about Falun Dafa and how its practitioners were persecuted in China from a leaflet she once obtained while in the United States. She was touched by the mentions of the practice in some of the dances. “I think the mission of this production, the mission of the performers, and their dedication to the work, is very important. And bringing awareness to what is going on in China with this particular organization,” Ms. Slade said. According to Shen Yun’s website, Shen Yun artists practice Falun Dafa, also known as Falun Gong—a practice that combines teachings for self-improvement and meditation exercises. And the practice “is a source of inspiration” for the performances. “I think when you have music and dance and you enlighten people’s spirits through the visuals, and through what they hear, without actually putting words to it, I think you touch people’s hearts in a much more profound and deeper way—and we need it. We need it right now big time in the world,” Ms. Slade said. Ms. Slade said she admired what the artistic director of Shen Yun had done, and expressed respect for everyone involved in the performance.